Quality delivered services and 100% satisfaction guaranteed! At the end of 2015 and the beginning of 2016 we are expecting an even greater demand for qualified and talented candidates with skills. According to analysis done by GANDER, there will be a greater demand for positions in IT, sales and marketing, as well as finance and administrative positions requiring more than two foreign languages. We also feel there will be a demand for skilled positions such as machinists, electrical engineers, as well as as core positions in construction and services. For more information, please, contact us at: info@gander.sk. The GANDER Analyses team made a representative sample survey of salaries combined with the availability of candidates. The focus was mainly on the profiles of specialists in four major industries. 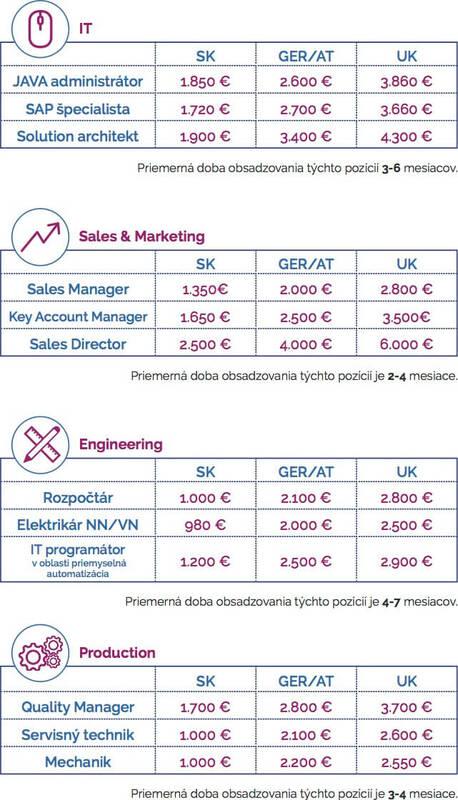 The survey focuses on median starting salaries as well as the length of the recruitment cycle in three markets – Slovakia, Germany/Austria and Great Britain.